The UK Royal Navy has selected General Electric (GE) Power Conversion to provide electrical propulsion drivetrain technology to support the Royal Fleet Auxiliary’s (RFA) new fleet of military afloat reach and sustainability (MARS) tankers. Under the contract, GE Energy will supply electrical propulsion drivetrain technology for energy efficient hybrid propulsion of the MARS support tankers. GE’s Power Conversion business marine vertical leader Paul English said: "Our electrical drivetrain technology will offer the Royal Fleet Auxiliary’s new fleet of MARS tankers a highly energy efficient, flexible and integrated power and propulsion system available to direct power as needed in support of their crucial military operations around the world." "Our electrical drivetrain technology will offer the Royal Fleet Auxiliary’s new fleet of MARS tankers a highly energy efficient, flexible and integrated power and propulsion system available to direct power as needed in support of their crucial military operations around the world." The four next-generation 37,000t MARS tankers are expected to enter service with the Royal Navy in 2016 to boost naval capabilities by delivering fuel and fresh water to vessels deployed across the globe. RFA is procuring double-hulled tankers to replace its existing single-hulled tankers to meet International Maritime Organization pollution (MARPOL) regulations, an International Convention for the Prevention of Pollution from Ships 1973 and the protocol of 1978, as well as European Commission environmental regulations. Comprising of advanced electrical and mechanical propulsion technology, the hybrid propulsion systems turn the ship’s propeller throughout its operating range of speeds while saving fuel, reducing emissions and maintenance costs of the main engines. The GE will deliver electric drive systems to Daewoo Shipbuilding and Marine Engineering (DSME), which was awarded a contract to construct four MARS tankers by the UK Ministry of Defence (MoD) in March. Hybrid propulsion systems deliveries to the Royal Navy are scheduled to begin in the fourth quarter of 2014 and will run through to Q2 of 2016. 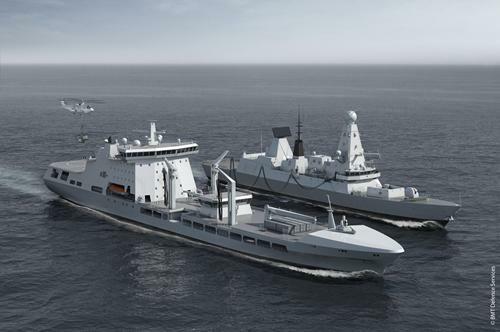 Image: Illustration of Royal Navy’s military afloat reach and sustainability tankers. Photo: courtesy of General Electric Company.